Nichola Eddery (1982) is a classically trained, a professional and exhibiting artist. Over several years Miss Eddery has studied under many leading classical art teachers at ateliers in Italy, France, and the USA; Charles H Cecil, Florence, Studio Escalier, Paris and Loire Vallery, L' Ecole Albert Defois, Loire Valley, Ryan Wurmser, California and Israel Hershberg, JSS, Civita, Italy. During and since her studies, she has exhibited in London and internationally. Nichola is passionate about sharing her Old Master techniques and has taught 1-1 and groups over the years. 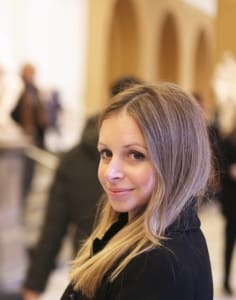 Since moving to London in 2017, Nichola has designed a variety of workshops and short courses offering her unique traditional drawing programs in three of London's most renowned museums. Nichola Eddery Atelier workshops and short courses are small classes designed for all levels of drawing experience, including the complete beginner. Nichola welcomes adults of all ages as well as an A-level student, to learn and draw from classical antiquity in The British Museum, sculptures in the V&A and from Old Masters paintings in The National Gallery. Nichola's drawing classes offer a unique blend of classical training and are intended to enable her to share her knowledge of the fundamental principles involved in traditional drawing. Her classes will be modelled on 19th-century French atelier practices that were derived from the Renaissance Masters' traditions. The techniques shown in class are the backbone to representational art. If you have any questions, please contact Nichola using the ‘contact host’ button on the website page. I had the most incredible drawing class with Nicola yesterday at The British Museum. Nicola teaches very traditional drawing techniques used by the old masters influenced by her modern teachings, her classes take you right back to the basics of representational drawing, they are hard but precise, and she is incredibly patient and informative. The other students in the class were great and we had such a brilliant afternoon. I feel that I learnt so much yesterday and I can not wait to book in for the next one. Thank you Nicola! Nichola have us a brief history of the Parthenon marbles then very detailed instructions how to set about drawing one of them. I did a two day course and Nichola was very helpful throughout giving individual help as needed. The atmosphere was very friendly and enjoyable. I was very pleased with the drawing I completed. I attended a full day drawing workshop at the V and A Museum and it was wonderful! Nichola is lovely, an extremely talented lady and a great teacher! As a complete beginner, I was naturally a bit nervous but Nichola was very patient, supportive, encouraging and explained processes clearly. For those of you wanting to learn a more classical detailed approach to drawing in amazing environments I simply can't recommend Nichola and her classes enough. Overall a great inspiring experience and I hope to attend again very soon. Thank you Nichola! Very good lesson, Nichola gave precise inputs on how to improve. really enjoyed the lesson, highly recommend it. I learned that I have so much to learn and, while daunting, this was very helpful. Her materials helped me to focus more on the preparation rather than on the actual drawing and I understood that I had not paid enough attention to this in my work. Nichola is an excellent teacher because: she comes prepared, her materials are clear and unambiguous, her explanations are clear, she circulates continuously giving each student time, and perhaps most of all, she is warm, approachable and she listens! I thoroughly enjoyed the experience and wish I lived in London so I could avail of access to this level of expertise all the time. The Venue was great. Surrounded by Art and Beauty what more could you ask. It gave a further dimension of authenticity to the course. I loved every minute! I had such a insightful morning learning the beginning skills of figurative drawing with Nichola. 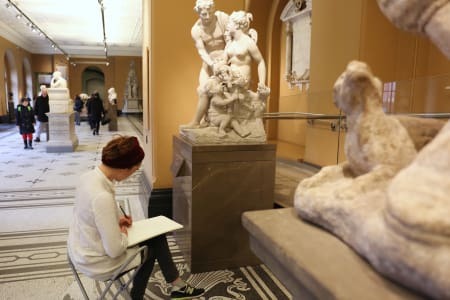 It was a spoiling treat to be able to learn to draw in the famous rooms of the National Gallery and by a brilliant teacher Nichola who can share her expansive knowledge of art experience and skills. I could not recommend this more and very much look forward to my next masterclass at the V&A with Nichola learning to draw from further great masters under her guidance. Nicola taught us a number of super insightful techniques in a very fluid way. It was all very seemless! We first did a couple of exercises in a quiet part of the gallery and then moved to one of the busy galleries towards the end of the session to put what we had learned into practice. Nicola was very thoughtful and explained every clearful. Would recommend! The workshop was an introduction to drawing using the Atelier 'envelope' method. Nichola is a really skilled artist and an engaging teacher. I am a beginner to drawing and Nichola was very patient and encouraging. The group was small, so we all had lots of one on one time with her. Highly recommended to anyone who is interested in learning this classical style of drawing. The National Gallery is of course a very inspiring venue, and the class is early enough to avoid too many crowds. It's always a pleasure to visit the British Museum and a greater pleasure still to attend this fantastic 2-day course in the Greek sculpture rooms. Nichola is an excellent tutor. The course began with a short explanation of the history of the carvings, then she distributed handouts to illustrate how best to approach the drawing. Nichola explained how to measure proportions of the bas reliefs and how to place the drawing on the sheet. While we were drawing, Nichola moved around the small group giving advice and instruction. On the second day we progressed to shading and modelling the drawings, again with all of the advice and encouragement necessary. The only minor problem with the course was that l found the level and length of concentration required over the two days was quite exhausting, but at the end l went home with quite a creditable drawing and a sense of great achievement, thanks to Nichola's well-judged advice and supervision. I thoroughly recommend this excellent course. This is a fantastic drawing course in every aspect, even for a beginner such as myself. - The material itself is very systematic and structured, following a series of key steps that help set up and expand on your drawing skills. This can be very helpful no matter what your level of drawing, but especially so for a beginner such as myself who can sometimes struggle to know how and where to start. - The material is presented by Nichola in a very clear manner, and Nichola is always happy to help with further instruction, giving good advice for any aspect of drawing even if not directly covered by class material. - Nichola is very experienced and comes with many years of technical training; this is reflected in the way she teaches and her knowledge of the subject matter. Additionally, she is also kind and with her feedback and genuine with her enthusiasm, characteristics which definitely enhance the class experience. She provides constructive criticism in a gentle and guiding way. - The location for the course is absolutely amazing. Having a drawing course here gives you even more appreciation for the beauty of these old sculptures. Learning with Nichola has also made me more aware of how these sculptures have been designed to be aesthetically pleasing. I have come away with even more appreciation for them. All in all, a fantastic experience that I cannot recommend more highly. Thanks!